A friend suggested I read the article, "My Vietnam" by Ellen Waterston [Winter, 2011.] It was well-timed because just yesterday, I was telling our dinner guests that when our family moved to Bend in 2005, I randomly called Vietnamese names in the phone books and finally talked, in great detail, with an elderly Vietnamese ex-intelligence man from Prineville. That makes me wonder what this coincidence means, and if the person in the article is the same man I talked to in 2005. What hit a nerve in the story for me was this paragraph: "Maybe it's our fatal flaw as humans that most of us can't care, get motivated, get engaged, have compassion about important social and political issues until and unless they affect us personally. Until there is no more gas at the gas pump. Until it is your son or daughter who does not return from Afghanistan. And even if we have strong feelings one way or another, our inclination to be socially or politically engaged is overwhelmed by busy-ness, so little time left in the day to weigh in . . . what with bills, jobs, families. But sometimes something jolts us into a deeper understanding." I am going through this myself, finding that sitting on the sidelines is no longer an option. Although the initial motivation was spurred by events affecting us personally, my deep involvement regarding this issue now is much larger than I had ever imagined. Thank you for reminding me of this human flaw and how active participation, at least for me, can lead one to gain deeper understanding about the self. 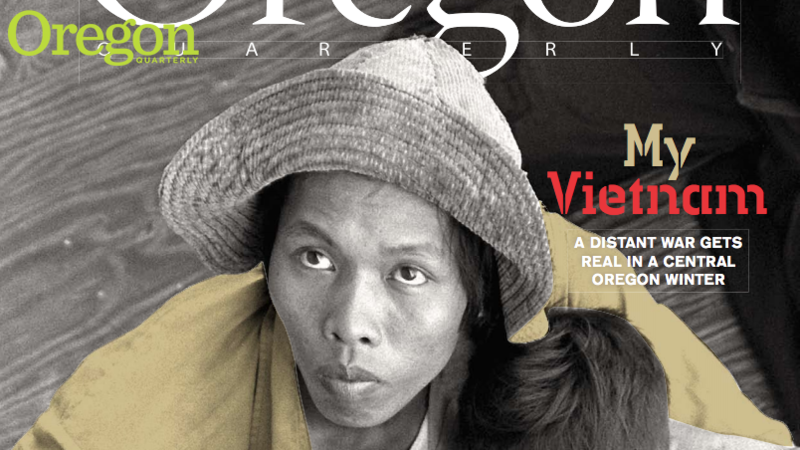 Whereas Ellen Waterston's story of Vietnamese immigrants [“My Vietnam”, Winter 2011] may be have been otherwise interesting, I take exception to her little editorial comment near the end which read, "Fired by the rhetoric coming from Arizona, from anti-immigration newscasts and political candidates, from voices of intolerance and fear. . ."
Waterston fails to distinguish xenophobia from an opposition to illegal immigration here. The "rhetoric coming from Arizona" is in response to the problems with illegal immigrants coupled with drug wars on the part of the drug cartels, which have spread to Arizona, particularly in Phoenix, where there have been numerous kidnappings related to the drug wars. Arizona's SB1070 law was passed out of frustration with the failure of the federal government to enforce the laws against illegal immigration, leaving Arizona and other border states to cope with the results. As for the "anti-immigrant newscasts and political candidates," this is another example of lumping anti–illegal-immigration sentiment with anti-immigrant sentiment. It's important to recognize the value of legal immigration while at the same time realizing the destructive effects of illegal immigration. I was completely, totally, and comprehensively blown away by Ellen Waterston's piece in Oregon Quarterly. It transported me back in time to late 1978 or early 1979 when I, as a relatively new reporter, entered a Vietnamese village—a trailer park in Palacios, Texas—with an Associated Press reporter to try to talk with anyone willing to speak about the community anger directed at these Vietnamese refugees who had become fishing competitors. That's a whole different story. Thanks for one of the best stories I've read in a long, long time. Thank you for publishing Narcissa Whitman's story by Debra Gwartney ["Narcissa Red," Winter 2011]. I did a similar project when I took an Oregon history class in the early '70s. I really felt a connection with Narcissa as I read all her diary entries starting back in New England. This was in a book that was in the "valuable books" section, which to my complete astonishment, they allowed me to take out of the library. I've always kind of worried about that book since the entries were in her own hand-writing and would have been quite valuable. My question is about the evening before the massacre. Gwartney's summary is very comforting for me because I've always been concerned about her being alone then. However, I thought I remembered that Marcus had had to be away for a while before the massacre and he only came home that afternoon after the women had been killed. I am therefore wondering about the paragraph about the time spent together the night before as much as I'd like to believe it happened. Was that from her diary or the woman who had been there at the time as a child? Debra Gwartney replies: Only one woman was killed in the massacre, and that was Narcissa. The rest were held hostage. The information about Marcus and Narcissa the night before comes from multiple sources including Marcus and Narcissa Whitman and the Opening of Old Oregon by Clifford M. Drury. I read with interest Debra Gwartney's article about Narcissa Whitman ["Narcissa Red"]. I went through high school in the Oregon school system. I found out later that the Whitmans were not the heroic characters I was told about in class. This year when studying Chief Joseph and the Nez Perce I read several accounts about how these missionaries converted the "savages." If the natives didn't see the light the Whitmans would tie their hands above them and fix them to a tree where they could be lashed until they did. This was only one of the insensitivities against a people who already had a deep spiritual connection with a higher power and, in fact, for the most part lived a more compassionate, cooperative, harmonious, aware, kind, and loving life than the missionaries who arrogantly assumed they knew a better way. Having just read the shocking news that President Lariviere's contract is not to be renewed by the State Board of Higher Education, I now read in your latest issue that the editor of the Oregon Quarterly magazine is also to be "terminated" ["Happy Trails," Winter 2011]. Just what is going on at the University of Oregon? I heard President Lariviere speak at the gala dinner of my UO graduating class of 1961 and found him to be most impressive, not least because of his academic credentials but also his vision for the future of the university. He seemed to be focusing on educational values rather than the rah-rah “go ducks”' mantra, which I have found very annoying. Former editor Guy Maynard responds: Most of the UO community, like Ms. Hendershott, was shocked and disappointed by the sudden dismissal of Richard Lariviere as president. On the other hand, I am leaving happily and of my own free will—and am delighted to turn the reins of the magazine over to new editor and publisher Ann Wiens. The article “Diet for a Small Planet” was pretty funny, despite the fact that the author's intent was not humor but rather socialist activism. Both Markowitz and Bowerman wear their hidden premise behind their data on their sleeves. Nowhere in the article are any data that support the statement they made at the end of the article, "If consuming less of non-essential goods and services is beneficial or necessary for long-term survival of our species . . ."
What? Because a rich guy ordered the surf and turf at Morton's Steak House instead of a side of broccoli, we're all doomed as a species? Give me a break. Both of these liberal socialists are bound and determined to prove this ludicrous point, when their own data (however dubious the poll results may be, owing to the fact that those polled were in heavily liberal populations) suggests otherwise. I wonder who paid for this study? The Socialist Party of America? Writer Mindy Moreland replies: The Campus Bike was designed for what a student's daily life would require of it—relatively short trips to and from campus of no more than a few miles— rather than for a fifty-one-mile marathon. Hence the twenty-inch, foam-filled tires, which did indeed mean that Scott was proceeding at a rather slower pace than the other bikes, all of which had conventional full-size tires (and electric assists, in several cases). I was pleased to read in the Winter 2011 edition of Oregon Quarterly that the University of Oregon is a "top military-friendly school by G.I. Jobs magazine" [Briefs, Upfront]. During my undergraduate years in Eugene, 1965–1969, I was enrolled in the Air Force ROTC (AFROTC) program. When I returned to campus in the fall of 1967 to begin my junior year, I had expected to continue to wear my uniform to AFRTOC classes. However, after being verbally abused and spat upon I discontinued that practice. Of course, many of those "protesting" were doing so in opposition to the Vietnam War. More than forty years later it's a pleasure to see the difference in acceptance of veterans on campus. I only recently got a chance to read the article by Lauren Kessler about Sarah Livia Brightwood's work at Rancho La Puerta [Hands-On Magic, Autumn 2011]. While I am always gratified to see Sarah Livia's many good works and tireless promotion of environmental education recognized, I feel I must clarify the record. After reading the article and viewing the pictures, one is left with the distinct impression that Sarah Livia single handedly designed the gardens at Rancho La Puerta, which is not accurate. In 1980, while still a grad student in landscape architecture at the UO, I began work on the landscape design of Rancho La Puerta. What began as a summer job opportunity became a sixteen-year project, wherein I oversaw the upgrading and remodeling of the extensive grounds and facilities of the ranch to more appropriately reflect the philosophy of the owners. For much of that time, I lived on the grounds while I designed or remodeled many of the buildings, the major public spaces, regraded landforms to restore natural drainages, designed pathways, terraces and plantings, and worked with the owners on master planning issues that promoted site repair and limited development footprints rather than sprawl. While Sarah Livia and I collaborated closely on the program and direction of the design, she relied on me to put form to these ideas while she lived in Oregon and later England. I also worked closely with Professor Lovinger on the Parque del Profesor project, overseeing the construction in his absence, and designing many of the auxiliary elements of the park. While I realize that the focus of the article was about Sarah Livia, and not the design process, neither was my contribution entirely irrelevant to that point. Sarah Livia and I share a deep reverence for nature, and a desire to demonstrate a different model for inhabiting the planet and caring for its inhabitants. For practicing designers, such as myself, getting proper credit for our work is a constant struggle, and this article did a disservice to me in that respect. As I read the article about the Hoedads ["With A Human Face," Autumn 2011] and then the follow up letters [Winter 2011], I wondered, "Where is the photo of a patch of forest replanted by the Hoedads? Let's see what it looks like all these decades later." I want to see the real outcome of their physical labors as well as their social labors.